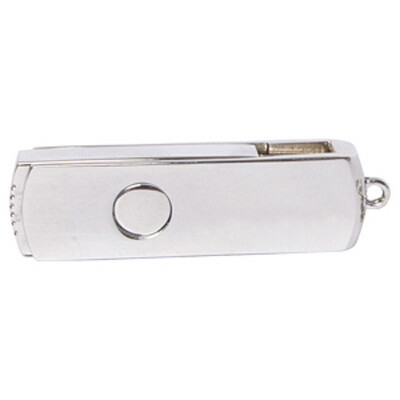 Features: Chrome swivel casing, Grade A memory, LED data transfer light, 10 Year warranty on data retention, 2 year replacement warranty on faulty manufacture.. Certification: CE, FCC, USB2.0, RoHS. Product Colour: Silver. Product Size: 55 x 15 x 9 mm. Print Area: 40 X 10 mm (front), 20 x 10 mm (rear). Print Process: Pad Print, Laser Engrave. Delivery: 2-3 weeks (indent) from art approval. Accessory Options: AC001: Lanyard, AC002: Mini Lanyard, AC003: Split-ring, AC004: Split Ring Chain, AC005: Snap Hook. Standard Packaging: Poly Bag. Packing Details: 100 pcs per carton, 3.0 Kgs, 29x21x4 cms. Setups: Included.